We’ve got you covered! February is Quezalguaque Library Month at the Friends of the Brookline Library Book Sale. Prices can’t be beat! All proceeds from sales during February will be donated to support the Sister City Project built library and mobile library in Quezalguaque. Items being sold include books, DVDs, books on CDs, music CDs, games and magazines. Brookline Village Library, 361Washington St.
Coolidge Corner Library, 31 Pleasant St. 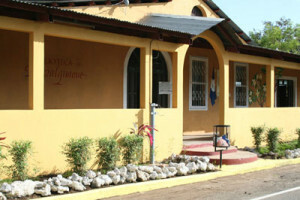 The Quezalguaque Library was built in 2004 as a cooperative project between the Brookline-Quezalguaque Sister City Project and the Town of Quezalguaque. Lead sponsorship support was provided by the Sister City Project and more than 20 persons from Brookline helped build the library. Computers and library furnishings were donated by the Brookline Rotary Club and the Town of Brookline. Brookline High School students raised $3,500 for book acquisition, and personal donations of Spanish books, music and board games were made. 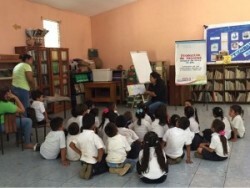 The Brookline Sister City Project continues to support the library today with funding for books and supplies, as well as for the transportation of a “mobile library” to primary schools in more remote areas of the community. 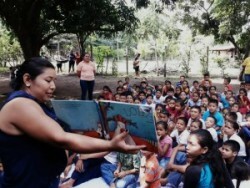 More recently we been collaborating with the nonprofit “Viva Leon Leyendo”, training library staff and volunteers to more effectively share the joy of books and the stories they tell. The Brookline- Quezalguaque Sister City Project (BQSCP) is working actively to improve rural water systems throughout the municipality of Quezalguaque in Nicaragua in order to expand access to clean water for all residents. Thanks to the generous donations from people in Brookline, a new rural water system was inaugurated Sunday January 13 in the community of Las Mercedes in Quezalguaque as shown in and the video. This short clip of the ceremony at Las Mercedes for launch of the new well last Sunday (January 13, 2019). The person in the blue checked shirt turning on the water is the Mayor of Quezalguaque, Henry Sandoval. Las Mercedes CAPS’ member Agustin Garcia is on the left in a red hat. A number of us including the BHS students met him and have heard him talk about the very difficult situation in the Las Mercedes community. On the right is the President of the Las Mercedes CAP, and further to the right in red is Daniela Canales, another person that many of us have met; she is the Treasurer for the Las Mercedes CAP. Rotary Club International, the municipal government of Quezalguaque and Rotary Club Brookline also provided funding for this new system in a community where just one year ago people’s access to water was limited to one hour per day. BQSC plans to continue to support improvements in the other rural water systems in Quezalguaque in 2019. We are not sending our usual snail mail appeal this year but hope you’ll still consider an end-of-year contribution. 2018 was a challenging year for the Sister City Project. We started the year on a high with a successful trip in February for work on a clean water initiative. 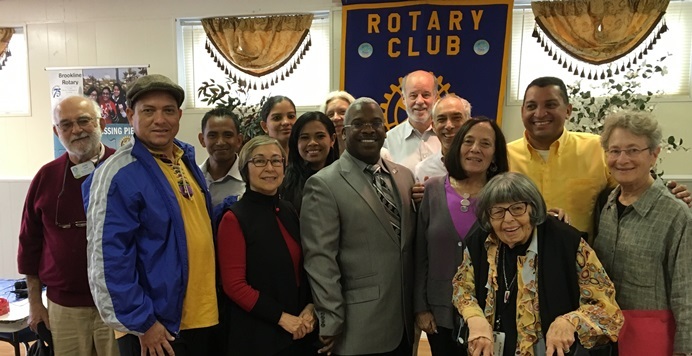 The following month, thanks to support from the Brookline Rotary, we received notice from Rotary International of a $35,000 award for the clean water effort. The next month was the first ever Brookline High School trip to Nicaragua (NI). After the students left Quezalguaque but while they were still in NI, demonstrations broke out in many parts of the country following notice of plans to cut social security benefits and increase taxes. Reports about the number of deaths since April vary but there appears to be agreement that it’s at least 300 with more than 2,000 injured. Because of the instability and the temporary closing of a collaborating medical school in Leon, NI, we cancelled a summer public health project in which Boston U. graduate students were going to be working side-by-side with Nicaraguan medical school students. Despite the continuing unrest and a deteriorating economic situation, our collaboration with the Quezalguaque community continues. We have an ambitious agenda to assure safe drinking water and support rural water systems maintained by community residents. We recently renewed contracts with a Nicaraguan based NGO for water systems engineering studies and training and with a university-based laboratory for water quality testing. Stephen Kinzer was the featured speaker at our Educational Forum in October. Kinzer is an authority on Nicaragua and has interviewed Danial Ortega, President of Nicaragua, and wrote Blood of Brothers: Life and War in Nicaragua. He is not optimistic for a quick solution to the troubles in NI. He saluted Brookline Sister City for its continuing work with the people of Quezalguaque. In the last two weeks, we responded to an urgent request for assistance to address threats of dengue. In the small community of Quezalguaque, there are 273 suspected and 34 confirmed cases. The threat of mosquito borne illnesses is greatest in the rainy season. This is usually from May to October in Quezalguaque. This year the threat has continued into December. Clean, accessible water is vital for the residents of Quezalguaque and we will be considering an award of $30,099 for improvements to the storage, pumping and distribution systems in 6 rural communities in Quezalguaque at our next Board meeting in January. The $30,099 will be in addition to $51,541 already awarded for the clean water initiative. We also continue to provide on-going support for the library in Quezalguaque, a mobile library, for arts programming and health care services. The Sister City Project has no office or paid staff and whenever Board members or others travel to Quezalguaque, they do so at their own expense. Your donations go to support our partnership with the Quezalguaque community. Tax-deductible contributions may be made on-line (see Donate button above) or checks payable to the Brookline-Quezalguaque Sister City Project (BQSCP) may be mailed to PO Box 114, Brookline, MA 02446. Thank you for your support. Without it, the collaboration between our two communities would not be what it is today. If you’d like to get involved or want more information about the Sister City Project, please write us at brooklinesistercity@gmail.com. We look forward to a more peaceful year ahead. Brookline High School (BHS) sophomore Willa Vish announced the launch of a campaign to sell reusable water bottles to help fund the Brookline Sister City Project clean water initiative in Quezalguaque. Vish made the announcement at the Sister City Educational Forum & Fundraiser at the Brookline VFW Post. Vish along with fellow sophomore Sophie Jelden were among the BHS students that traveled to Quezalguaque in April 2018 and this fall they led efforts to organize a BHS student club to support Quezalguaque and the Sister City Project. Social studies teacher Joanne Burke-Hunter traveled to Quezalguaque with the students in April and she is the faculty advisor for the newly authorized club. 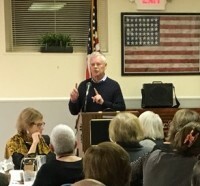 Speaking to the attendees at the event that featured former Governor Michael Dukakis and award winning correspondent Stephen Kinzer, Vish explained that the BHS club’s first project is selling reusable water bottles. Funds raised by the sale will be donated to the Brookline Sister City Project for the clean water initiative funded by the Sister City Project for the Quezalguaque community. Vish and the members of the new club not only hope to raise money for and build awareness of the Sister City Project but they are promoting the reusable water bottles as an alternative to single use plastic commercially sold water bottles. The typical American reportedly uses an average of 167 plastic water bottles per year. With promotion of reusable water bottles, the goal will be to dramatically reduce and eventually eliminate single use plastic bottles. Vish, Jelden and the other students in attendance at the Sister City Ed Forum received orders for more than 40 bottles at the event. The bottles are branded BQSIP for Brookline-Quezalguaque SIP. Sister City Board member and liaison to the Brookline schools, Stacey Downey introduced Vish at the event and commended the students for establishing the club and taking on the new initiative.